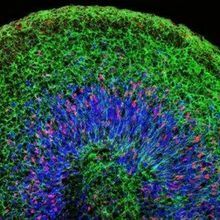 Cross-section of cerebral organoid; All cells in blue, neural stem cells in red, and neurons in greenMADELINE A. LANCASTERIn an Austrian laboratory, a team of scientists has grown three-dimensional models of embryonic human brains. These “cerebral organoids” are made from stem cells, which are simply bathed in the right cocktail of nutrients and grown in a spinning chamber. Over a few weeks, they arrange themselves into pea-sized balls of white tissue, which recapitulate some of the complex features of a growing brain, including distinct layers and regions. 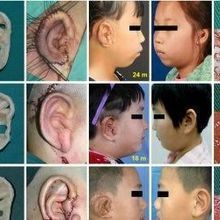 These models will not help to unpick the brain’s connectivity or higher mental functions but they are excellent tools for studying both its early development and disorders that perturb those first steps. For example, Knoblich’s team produced unusually small organoids using stem cells taken from a patient with microcephaly—a neurodevelopmental disorder characterized by a small brain. Knocking out microcephaly-associated genes in mice does very little because murine brains develop differently than humans’. The organoids could help to bypass the limitations of these animal models, providing a more accurate representation of human brains. Madeline Lancaster, a member of Knoblich’s group, created the 3-D models from small clusters of stem cells. She bathed the cells in nutrients that nudge them toward a neural state, embedded them inside a gel for structural support, and grew them in a spinning bioreactor to help them absorb more nutrients. It took a huge amount of work to fine-tune the conditions, but once the team did, the organoids grew successfully within just 20 to 30 days. Using molecular markers tuned to specific parts of the brain, Lancaster showed that the organoids develop a variety of distinctive zones that correspond to human brain regions like the prefrontal cortex, occipital lobe, hippocampus, and retina. They also included working neurons, which were produced in the right way—they were made by radial glial cells at the innermost layers of the cortex, before migrating to the outer layers. Other scientists have developed organoids that mimic several human organs, including eyes, kidneys, intestines, and even brains. For example, in 2008, Yoshiki Sasai’s team at the RIKEN Center for Developmental Biology showed that stem cells can be coaxed into balls of neural cells that self-organize into distinctive layers. But compared to this earlier attempt, the new organoids are “the most complete to date in terms of features that directly resemble those in the developing human brain,” according to Arnold Kriegstein, a stem cell biologist from the University of California, San Francisco, who was not involved in the study. 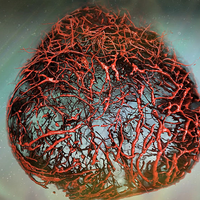 Having refined their technique, the team created a “personal organoid” from a Scottish patient with severe microcephaly, who had several mutations in a gene called CDK5RAP2. They took skin cells from the patient, reprogrammed them into a stem-like state, and used them to grow organoids that ended up much smaller than usual. By dissecting the organoids, the team discovered the reason for this stunted size. When healthy brains develop, radial glial cells first divide symmetrically to increase their numbers before dividing asymmetrically to produce neurons. In the microcephalic organoids, this switch happens prematurely, and neurons start forming when the pool of radial glial cells is too low. As a result, the brains do not develop enough neurons and end up small. CDK5RAP2 is responsible for this premature switch; when the team added the protein back into the mutant microcephalic organoids, they grew to a normal size. 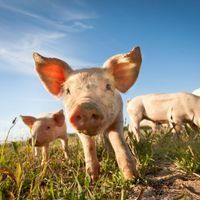 Wieland Huttner, a neurobiologist from the Max Planck Institute of Molecular Cell Biology and Genetics, said that these results merely confirm what others had already suspected about CDK5RAP2. However, the organoids could be more useful for understanding other microcephaly genes whose roles are still unclear. In the future, he hopes to develop larger organoids. For the moment, the models cannot get any bigger without a blood supply, and their interiors are dead zones comprised of starving, choking cells. If the team can solve this problem and coax the organoids to continue growing, they might be able to capture later events in brain development, which may be relevant to other disorders, like autism. “That would be a gigantic step forwards,” said Knoblich. M.A. 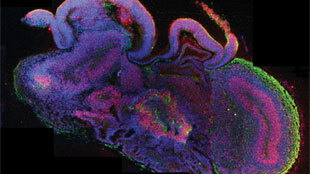 Lancaster et al., “Cerebral organoids model human brain development and microcephaly,” Nature, doi: 10.1038/nature12517, 2013.